Blog | Bartok design Co. Blog – Page 55 – Bartok design Co.
A fixed bench to enjoy reading while bathing. Straight hinoki: 1300 x 700mm x 573mm deep. A simple, refined balance for this famous designer project. The spout can be opened from the top for easy maintenance. 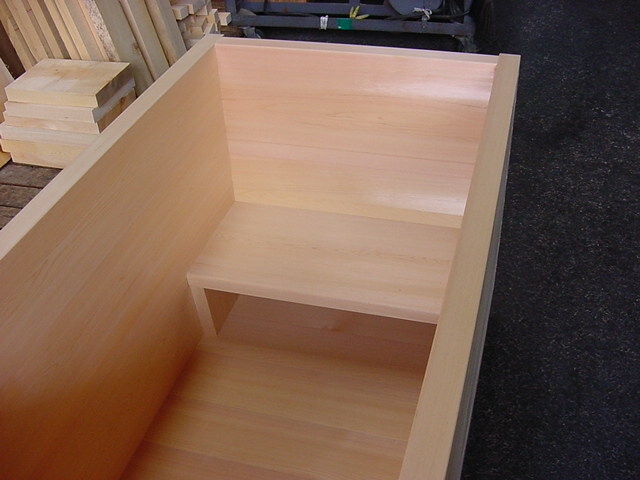 As the tub does not have corners, you feel pleasingly contained by the warm honey-like color of hinoki. This wooden tub is equipped with a floor mounted spout. This has to match the slanted/curved edge of the circular tub. The “waterfall” balances the composition and add to the relaxing effect of japanese style bathing. 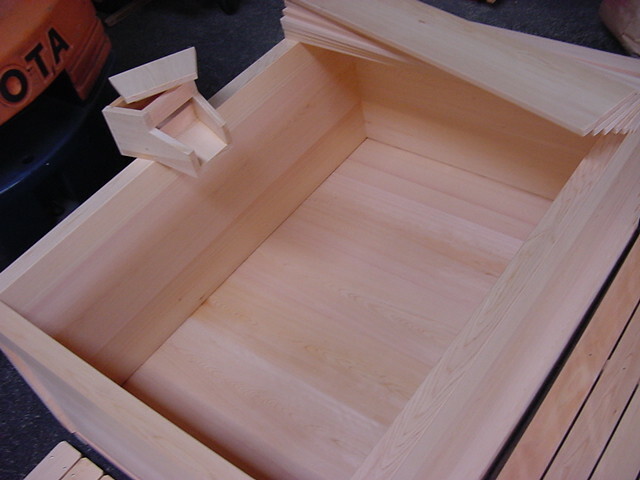 Straight hinoki: 1524mm diam. x 660mm deep. 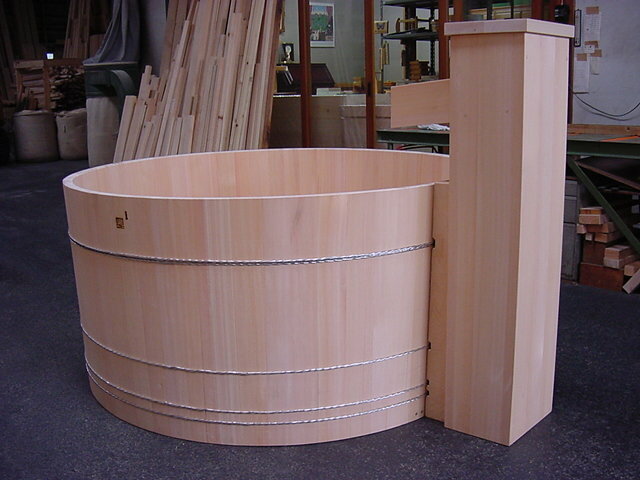 Round wooden tubs tend to be more expensive due to the manufacture and top grade material. 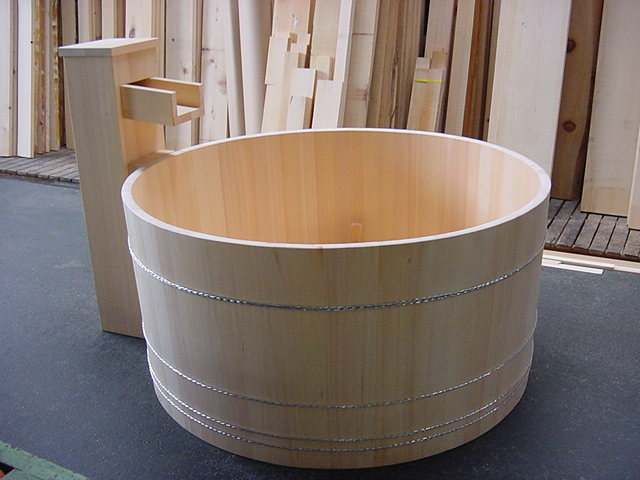 Here is a detail of the wall-mounted “waterfall” spout in hinoki wood and japanese style bathtub cover. Straight hinoki: 1600 x 1143mm x 660mm deep. 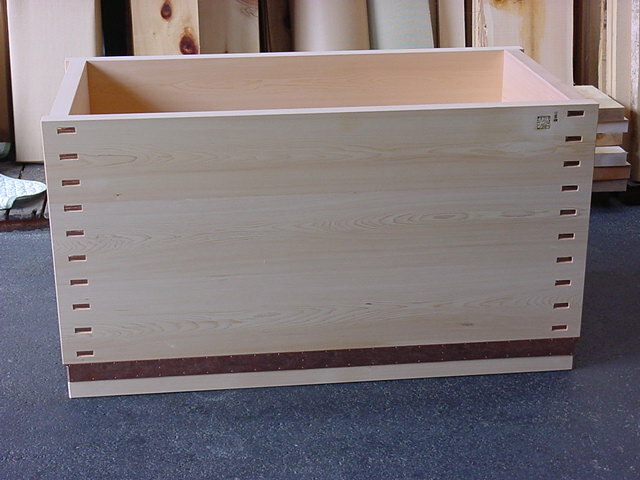 This is a complete set with custom size floor hinoki duckboards and spout. 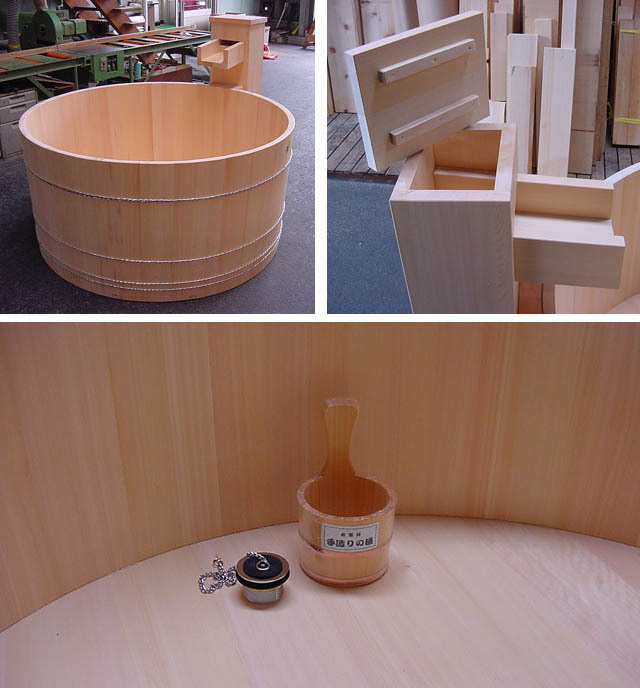 Straight hinoki wooden bathtub: 1220 x 865mm x 610mm deep. A very nice natural pattern for this simple composition. Several years ago I purchased a tub from Japan and it came with a container of a kind of cleaning/conditioning fluid for the tub, which included a hinoki oil base. Do you offer, or know where I could obtain, something similar? as in other countries, hinoki oil is available for aromatherapy in different formats, including a liquid emulsion to be poured inside the hot water to have a hinoki-tub-like aromatic effect. This is not used for cleaning. Hinoki wood contains within its fibers the resinous product commonly known as hinokitiol. Usage of cleaning products such as detergents or waxes/oils will clog the natural wood pores thus sealing inside the hinokitiol. If you want to take maternal care of the tub, you may wipe it with a towel after use which will prevent any darkening caused by mold. Then keep a hygrometer inside the bathroom and avoid the relative humidity to drop below 50%. See also our news and products page. We have now a natural oil extract which can be used to clean, protect and regenerate the tub. 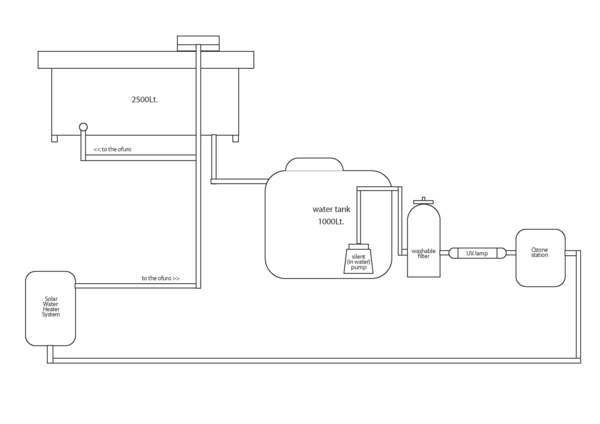 how are the modern Japanese recirculating water through a heater? Or are they mainly designed for one session of hot water? 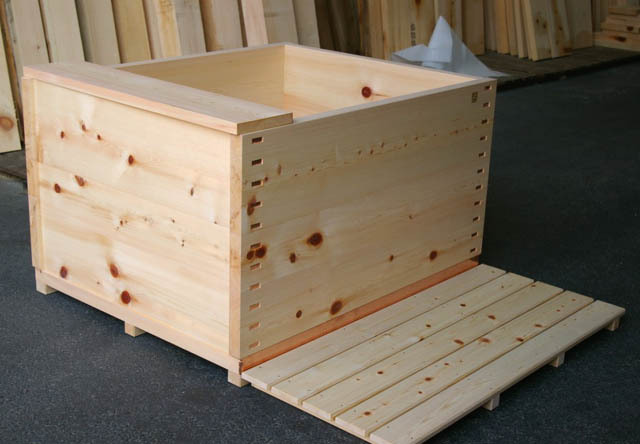 The japanese tub is a very simple, low tech, minimalist box made out of wood. For this reason it is also very flexible and can adapt to different uses. In our experience, most of the private clients drain it after use. Anyway one session can be extended for a whole day with the use of tub covers and by adding hot water at need. 3) It is very easy to open a hole in solid wood with the pitch and diameter matching your equipment. I hope I answered your question. 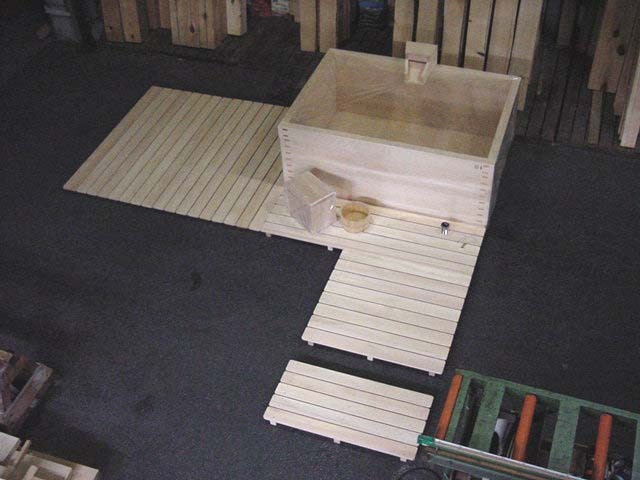 Our tubs are custom made to fit the particular needs/sizes of each site and most of the solutions are evaluated case by case. 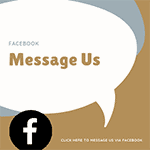 Please do not hesitate to contact us for any question or problem.